Now that spring is here, it is time to start preparing for the horse shows. One of the most important steps to prepare your horse is to schedule a spring health check and vaccinations with your veterinarian. There are several mandatory and recommended shots your horse must have to be able to compete in 4-H horse shows. 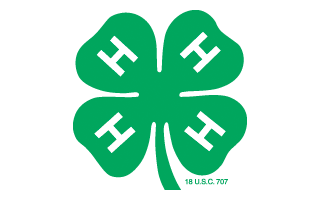 For the most up to date information on these vaccination requirements, please go to the New Jersey 4-H horse show website and download the State Horse Show rule book. Current vaccination requirements are listed in this document. 1. ALWAYS clean your trailer between trips, especially when you are transporting horses which reside at different barns. 2. DO NOT SHARE water and feed buckets. Every horse should have their own water and feed buckets. Common equine ailments like Strangles are easily spread by horses sharing water and feed buckets. Some horses carry the bacteria for Strangles (and some other diseases) without showing any outward signs of the disease. MARK YOUR BUCKETS so you can keep track of which buckets belong to which horses. 3. When filling water buckets, DO NOT allow the end of the hose to fall into a bucket. Saliva from one bucket can be transported to another bucket if the hose is actually in the water and then run to the next bucket. Clean water buckets between shows with a mild bleach solution. 4. To reduce worm infestation, it is best NOT to lay water hoses on the ground where they can become contaminated with manure. Always hang them up to dry – preferably in a sunny spot. Sunshine can kill many viruses, bacteria, and parasite eggs. 5. It is not advisable to allow horses to graze in an area where other horses that are not from their same barn may have grazed. Feces or saliva from other horses may still be in that area and be contaminated with bacteria, viruses or worm eggs. 6. Try to avoid nose to nose contact with horses that are not already housed together. While it is fun to hang out with your friend and her/his horse, this close contact can spread infection. 7. When you get home, clean and disinfect your trailer, equipment, and buckets, and change your clothes. The USDA brochure noted below has some great information on effective disinfectants. 8. Ideally a horse that has been off site at a show should be quarantined for at least two weeks. If this is not possible, at least avoid nose to nose contact with other horses on your property and make sure EVERY horse is up to date on vaccinations even if they do not go to any shows. 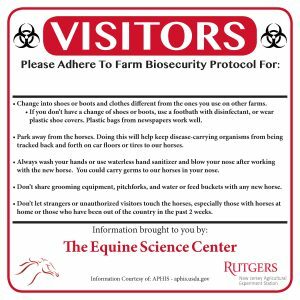 A couple of great resources to help you prepare for the show season and implement biosecurity measures can be found on the Equine Science Center’s website. More kid-friendly sections are on Lord Nelson’s Blog, such as this post on biosecurity. For signs to remind visitors to your farm about biosecurity measures, go here. In this USDA publication, you will find great information on how to mix your own bleach disinfectant and keep your farm safe. Try this biosecurity fact sheet from veterinarians in the UK.